Good Night Messages For Girlfriend : Make your affectionate relationship more attractive by sending these Good Night Messages For Girlfriend before going to sleep. Say goodnight to your girlfriend with sweet good night wishes that will bring pretty feelings to her mind. Make her feel the luckiest girlfriend of the world and greet her good night with some special and romantic words which will be the sweetest way to say goodnight. Though, every girl expects special care from her beloved boyfriend all time but especially at night when you both are miles apart. 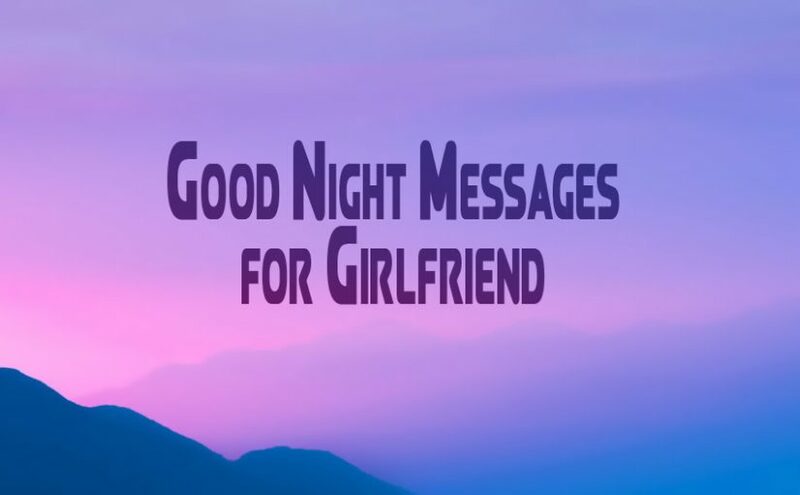 So, express your special care to your girl by sharing these good night messages and show how much you are missing her deep inside of your heart before going to bed on this lonely night. The Earth moves around the sun, it’s an eternal truth. Just like our bond, it is also eternal. I miss you a lot. Have a nice sleep and beautiful dream. Good Night my dear! Sweetheart! I cannot wait any longer to be in your arms. My wish will come true one day that we wake up together in the morning. Till then Good Night! When I go to bed I miss something. That is you, dear! So, I take my cell phone and send you a text. Have a sweet dream my love, Good Night! The last person I think of while going to the bed is you! Have a lovely sleep with sweet dreams Sweetheart! Good Night! Sometimes I may be alone, maybe sleepy but that cannot restrict me from sending you lovely messages, sweetie! I will keep doing this until the night we are together with each other! Dear! Do you know the moon is angry at me and also jealous of you? Because I told her I don’t need her light anymore because I Have my girlfriend. Have a sweet dream, my love. Good Night! During night you are my patient. So, I’m giving you a prescription in this message. Take good night as a dosage for the night, it includes all nice dreams and removes all bad images from mind! Baby! Don’t waste your time thinking the past, don’t lose your hope thinking the future. Please kill some mosquitoes so that you can sleep well. Ha ha ha. Good Night! Sometimes I think that my pillow is luckier than you are. Because it has the fortune of having my cuddling every night but you don’t have that! Good night my unlucky Gf! Good night sweetheart! Don’t look at the window at night. Also don’t look under the bed. There may be something! Just kidding! Have a sweet dream my love! You are sleeping right now and I’m thinking of you, my baby! You are the most beautiful girl I had ever meet. I’m very lucky. Goodnight my Love! Have a sweet dream! Sorry for not always being by the side of you, sorry for not hold you right now. But keep one thing in mind that you are always in my mind dear! Good night and sweet sleep! During the night I’m waiting for the day. Because I cannot stay without seeing you for a long time. I miss you all the time you are not with me. Good night my love! Stay well! This message is the document of my love! Though I cannot express my feelings, I can show a little bit by my messages. Have a sweet sleep dear! Good night! Last night I cannot sleep well. I woke up after a minute. I thought I forgot something to do but then realized that I forgot to say you good night. Good night my love! As the clock ticks away to midnight, I just want to say that you are the prettiest and the most beautiful girl in the whole universe. I love you, good night. I don’t dream about you, because I can never fall asleep thinking about you. Good night sweetie! At night when air blows my hairs, I supposed they are your kisses, Missing you too much my love! Good Night! The day is busy enough to keep me occupied. In the quiet of the night, I begin to really miss you. Goodnight sweetheart. My girl, I am sending you lots of hugs, A blow of kisses, And, cuddles and more, Just to show that I love you so much, Just to show that I am missing your touch I love you, Wish you a lovely night! I just can’t describe, how I feel. With my loneliness, I just can’t deal. All I can think of is meeting you. This intense despair, I hope you can feel too. Good night. You may think that I forgot you. You may think that I don’t care, and you may think that I’m not thinking of you. Well, you’re wrong. You’re still in my dreams. I wish I could come there to you, I wish I could hug you tight, Instead of just wishing you a plain good night, Anyways do dream of me on this night, And sleep tight! Just like the sun and moon are destined to rise in their particular time. I am destined to be with you forever. I miss you a lot. Have a nice sleep with beautiful dreams. Good night. Marshmallow clouds and fluffy puppies, chocolate trains and golden cars, may your imagination go wild and your dreams are full of the most amazing fun! Good night my love! Put your right hand on your left shoulder and your left hand on your right. It is a hug for you before you fall asleep. Good night sweet dreams. The last person that I remember while going to sleep is the one that is reading this text. I miss you a lot, my girl. Good Night. Have sweet and sour dreams! As the moonlight dims and the world goes quiet, give yourself some rest. Here’s to hoping that your sleep is as sweet as you are. Good night my love! There are thousands of stars in the sky that shine, but for me, you are the brighter and most shinier. I love you with all my heart. Have a nice sleep with lots of beautiful dreams. Good night. There may be a billion yesterdays and a trillion tomorrows, but there is only ever one today. I would never let one day pass without letting you know that I am thinking of you. Your boyfriend has a love-hate relationship with the night. He hates it because he can’t be with you, but he loves it because he can dream about you endlessly. While looking at this blissful night with romantic moonlight and a cool breeze with glitters of stars up in the sky. I can only wish that you would have been with me. Good Night. I love you so much babe. Behind your eyes lies a world full of colors and every beautiful thing that is connected to your lovely heart. Sleep tight and meet me in dreams. I am waiting for you sweetheart. Do you know what is temporary? The twinkle of the stars which disappear as the sun rises in the east. Do you know what is permanent? The way in which for you, my heart happily beats. Good night. Feel free to let your toes peek out from under the covers. No boogeyman will dare to come out with me right beside you. Bedbugs? Not with me around. Sleep well, my lovely! Do you know why I always sleep earlier? Because in my dreams I always meet you there and spend some quality time with you. I just can’t wait to be with you, whether it is in dreams or reality. Good night, love. See you there. After looking at all these stars I realized, they are nothing in comparison to the sparkle that I see in your eyes when you see me. I love you so much, my beautiful girl. Have a really good night with lovely dreams of me. 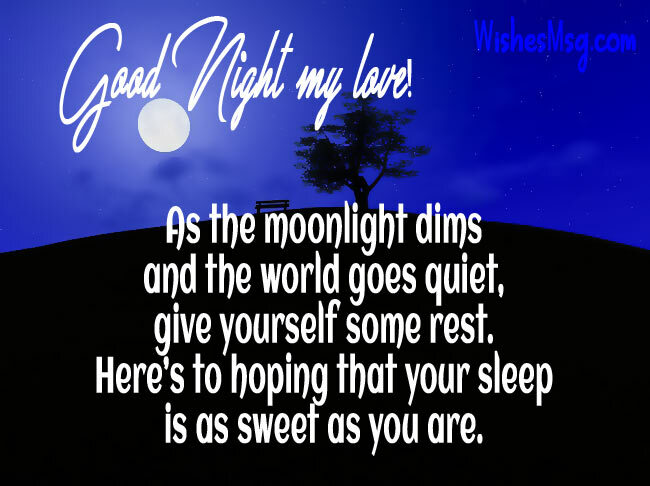 Whatever you need good night SMS for girlfriend or good night text for her, these goodnight messages are perfect for that. 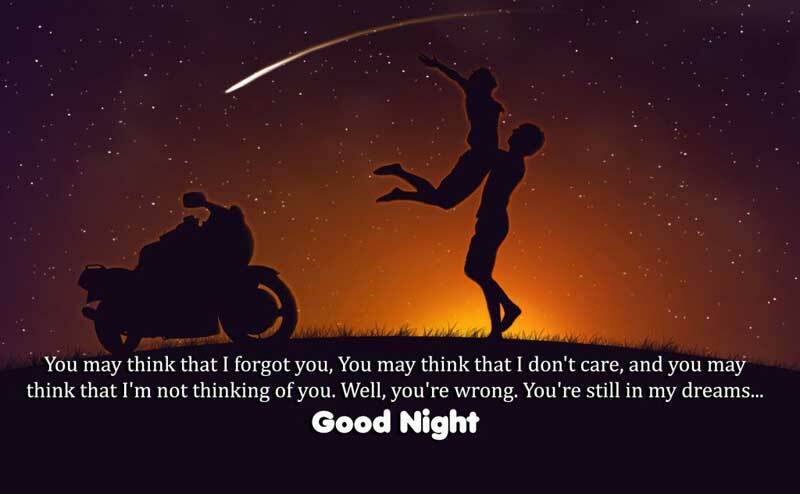 We hope that our compiled good night messages for girlfriend will help you to greet your girlfriend a lovely night and sweet dreams with a smile on face. Do it every night before you fall asleep and she will feel proud by having you as her beloved boyfriend.